Magical moments happen here every day! Take a photo with a dolphin giving you a friendly kiss on the cheek! Soar through the water with our thrilling dolphin foot-push! Become a Dolphin Trainer for a day! All Programs begin with a brief 10-minute orientation led by the trainer. Pregnant women or people with medical conditions such as heart or back problems are not permitted. This is the perfect choice for children and those who want to keep things relaxed. This fun and easygoing program is like an up close and personal, dolphin meet ‘n greet. Enter their lagoon home to shake their fin, and even receive a dolphin kiss on the cheek. Equipped with a mask, you get to see the dolphin swimming underwater as it thrusts through the water at incredible speeds. At the end, you get a chance to take a professional photograph with the dolphin so you can share this memory of a lifetime with everyone on Facebook! Read more about the dolphin interactive program. This is exciting program includes everything from DIP plus a thrilling dorsal ride. Hang on to a dolphin’s dorsal fin as it propels through the water at an exhilarating speed! Read more about the dolphin & ride program. This is our ultimate dolphin program. This includes everything that comes withDIP+DSR but with twice the fun. Not only do you get a chance to meet and swim with two dolphins (other programs include one) but you get to pick between a two-dolphin dorsal ride, or, a DSP exclusive, a two dolphin foot-push! Read more about the dolphin swim program. Become one of our dolphin trainers for a day! Get a behind-the-scenes tour and learn all the basics of dolphin training how we feed the animals with the healthiest food, in keeping with their natural dietary habits and best of all!! Swim and dive with the dolphins! 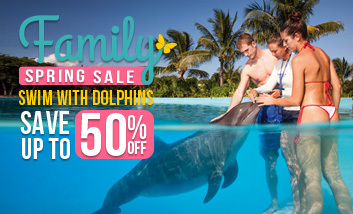 Pet, hug and kiss them, shake their fin and do the famous “Foot-push” or “Dorsal-Ride” interactive behavior where the dolphin proper you across the lagoon! 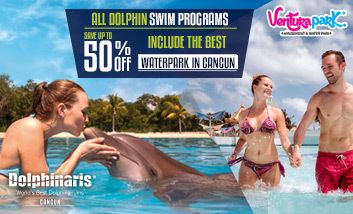 The exclusive “Dolphin Dive Experience” specially designed for first-time divers (no previous experience is required), allows you to admire underwater the dolphins’ incredible agility, in their own element. Read more about the dolphin trainer for a day program. Compra tu paquete AHORA y recibe un 30% de descuento AQUÍ.